PES 2013 could feature a fully-licensed Argentinian and Brazilian league, as well as an update which will see all player faces re-designed, improving the realism of the game. Kinect support is also planned for next year's title. 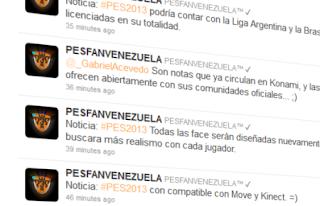 This is all according to PESFANVENEZUELA, who first posted the content on their Twitter account earlier today. We would like to reiterate that these are only rumours. Like every rumour, we urge you all to take them with a pinch of salt. However, we appreciate that there's no harm in posting things like this - occasionally - as it allows PES fans to discuss the future of the series.